"There's Gonna Be A Rumble"
Renowned from Stockholm to Los Angeles as Australia's wildest and most gifted exponents of authentic Rockabilly, Wes Pudsey and the Sonic Aces have, over the course of seven years and more than four hundred live performances, earned themselves a reputation for crafting some of the most memorable anthems to emerge from their native country's independent music scene. Formed by singer songwriter Wes Pudsey in mid ­ 1997, the four ­ piece outfit launched such a successful assault on their native Sydney's premier live music venues, including the Annandale Hotel, the Iron Duke Hotel, and Bar Broadway, that they soon found themselves joining one of the country's biggest recording acts at the Enmore theatre. Opening for You Am I in August 1997, the Sonic Aces' exhilarating music and performance had the audience of 3000 plus howling for more. Since those early days, Wes and the Aces have performed extensively all along the east coast of their homeland, and toured Europe in September and October of 2000 following the success of their albums in the European and Scandinavian markets. At home, they have toured with a variety of visiting overseas acts, including Southern Culture on the Skids, Restless, the Space Cadets and Stan Perkins, the son of legendary Rockabilly Pioneer Carl Perkins. Following the 1999 release of the group's ground-breaking debut album My Baby Rocks Like Betty Page, with its acclaimed singles My Baby Looks Like Betty Page and Maybe, four Sonic Aces numbers were featured on the Preston Records Compilation Preston Rockabilly at the end of that year. 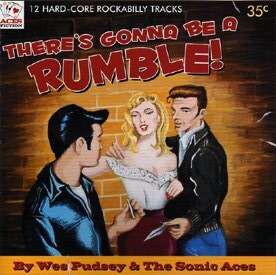 Like its predecessors, Wes and the Aces' new album for 2005 There's Gonna Be A Rumble continues to showcase the songwriting and performance skills that have earned the band a name as one of the world's hottest roots music acts. This year will again see the formidable talents of guitarist Robert Taylor, slap bassist David Bean and drummer Bruce "Bruiser" Dunlop thrill audiences across the nation and beyond as Wes Pudsey and the Sonic Aces embark on their largest touring schedule yet. From Sydney to Melbourne, Adelaide to Perth, Paris to Berlin, this dynamic combo will be rocking a town near you in the not too distant future. Singer/songwriter Wes Pudsey first came to prominence in 1991 with country rock group Tennessee Thunder, whose single "C'mon Everybody" was a country hit in early 1992. Possessing an amazing multi-octave vocal range and a dynamic stage presence, Wes went on to home his craft with the now legendary Atomic Creepers during the 1990's. In 1995, he formed the original Radium Club Hepsters, a Swing/Jump Blues combo that preempted the current interest in Swing music by five years. Renowned for his electric performances both live and recorded, he has recently been performing in Europe. Guitarist and composer Robert Taylor first picked up the guitar at the age of eight, and was performing at venues across Sydney from the age of thirteen onwards. The six-string virtuoso made a name for himself soon after leaving high school as one of Australia's most capable finger-picking stylists, and he has made some fine recordings in the vein of Merle Travis (Runaway Guitar, 1998) and Chet Atkins (Winter Sands, 2000). Robert's reputation as a wild man on stage began with performances with Dixie Rumble in 1997 and were consolidated by his three-year run as lead guitarist with Australia's most acclaimed Rockabilly outfit the Sonic Aces, with whom he toured Europe in September and October of 2000. Like many young rock drummers, Bruce "Bruiser" Dunlop began performing whilst in high school with a variety of bands. He graduated to working "freelance" throughout Sydney, performing with local and visiting bans including the Hollywood Hombres and Melbourne's Flatfoot Shakers, before finding the band he had been looking for, the Sonic Aces. As a thoughtful and creative drummer, Bruce is renowned in his native city as the King of the Dance Beat, a hard-swinging human metronome who is more than adept at lashing out with provocative tom-tom work and hard-driving rhythms on those wild up tempo rockers as well. Starting his career as a founding member of the Atomic Creepers at the age of seventeen, Dean Upston has established himself as one of Sydney's most respected roots bass players. Following his wild tenure with the Atomic Creepers, Dean went on tour Australia extensively with the now acclaimed Buddy Holly Tribute Show, Buddy's Back as well as contributing his songwriting and performance expertise to late Œ90's punk/rockabilly outfit Johnny Bonehead. Before taking his permanent position with the Aces, Dean formed the popular local group Rock Therapy.